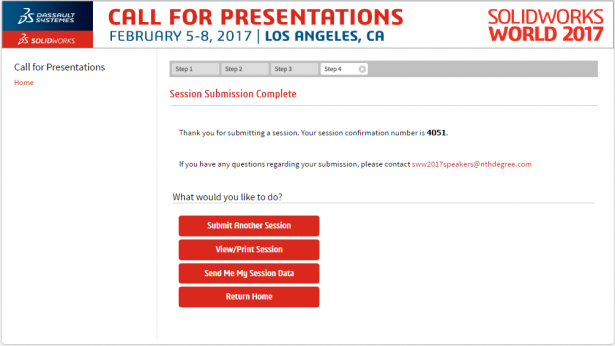 As everyone may or may not know SOLIDWORKS holds a user conference every year and it has come time once again for SOLIDWORKS to ask it users to submit ideas for presentations for the upcoming SOLIDWORKS World. So the questions that arise are Where in the world is SOLIDWORKS World, When is SWW, What is SWW, Why is SOLIDWORKS looking for presentation ideas & How is it going to benefit me if I submit a presentation idea? Where in the world is SOLIDWORKS World? Every year SOLIDWORKS World is in a different location. This year it is in, Los Angeles, California. Past locations have included Las Vegas, San Diego, New Orleans, Orlando, San Antonio, Anaheim, Phoenix & Dallas. When is SOLIDWORKS World? This year it is Sunday February 5th thru Wednesday February 8th, 2017. Generally SOLIDWORKS World is held anytime from mid Jan. to mid Feb. each year. What is SOLIDWORKS World? SOLIDWORKS World is an annual user conference that SOLIDWORKS hosts for its users and is attended by over 5,000 users. The conference gives all the SOLIDWORKS users a chance to get together in one location and see over 100 presentations on all aspects of the software. Attendees have the ability to see the different partner products that SOLIDWORKS has to offer along with seeing some of the products that are designed in SOLIDWORKS. The conference offers the opportunity to take SOLIDWORKS Certification Exams or enter into a SOLIDWORKS modeling competition. Why is SOLIDWORKS looking for presentation ideas? The presentations that are offered at SOLIDWORKS World are presentations or hands on sessions that are created by the users, resellers and SOLIDWORKS employees on every topic from hardware setup to surface modeling. The sessions are intended for users of all experience levels to learn more about SOLIDWORKS and how to more effectively use the software. 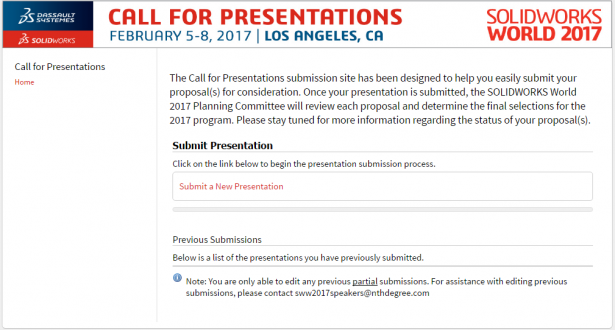 How is it going to benefit me if I submit a presentation idea? 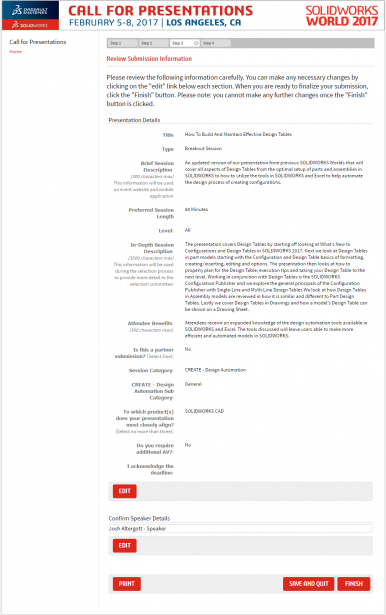 When you submit a presentation idea and it gets accepted SOLIDWORKS will pay for your entry fee into SOLIDWORKS World. The only cost incurred by the presenter is hotel, meal and travel costs. I started presenting at SWW2006 and have presented every year since. For SOLIDWORKS World 2017 I have submitted two presentations. I have enjoyed each year that I have been to SOLIDWORKS World and always gotten positive feedback from each of my presentations. 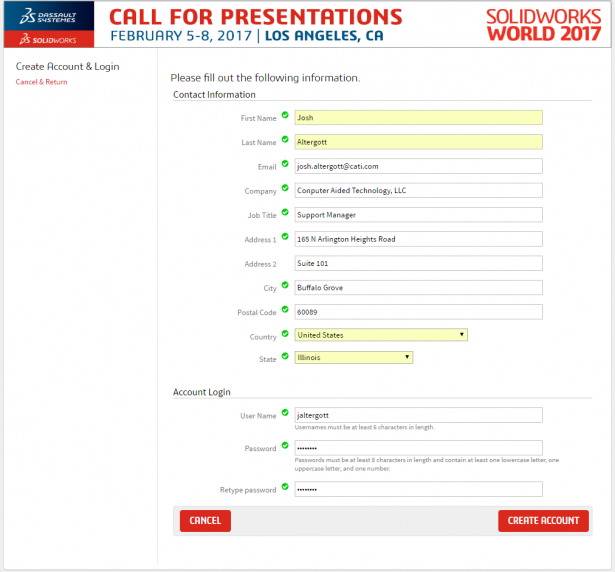 If you would like to submit a presentation, go to this web page and fill out the online form SOLIDWORKS World 2017 call for papers. The deadline to submit ideas is September 14th, 2016 so get your ideas in soon as space is always limited. I would also suggest to type out your ideas in Word first so to check spelling, grammar & word count. I have included a series of screen shots from the online form to give everyone an idea of what SOLIDWORKS is looking for. Good Luck and I hope to see you in Los Angeles next February. Step1 – Create your account.